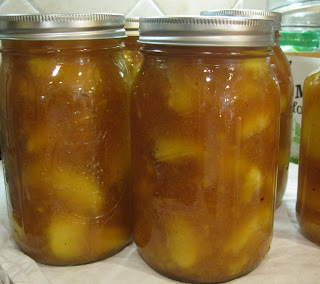 Last year, I canned peach pie filling on a whim. I’ve canned sour cherries for pie for years and years, but never peach. I concocted a spicy blend with cinnamon, cardamom and ginger. All throughout the year, when I pulled a jar off the pantry shelf, intending to make a pretty pie, crisp is what emerged from the oven. 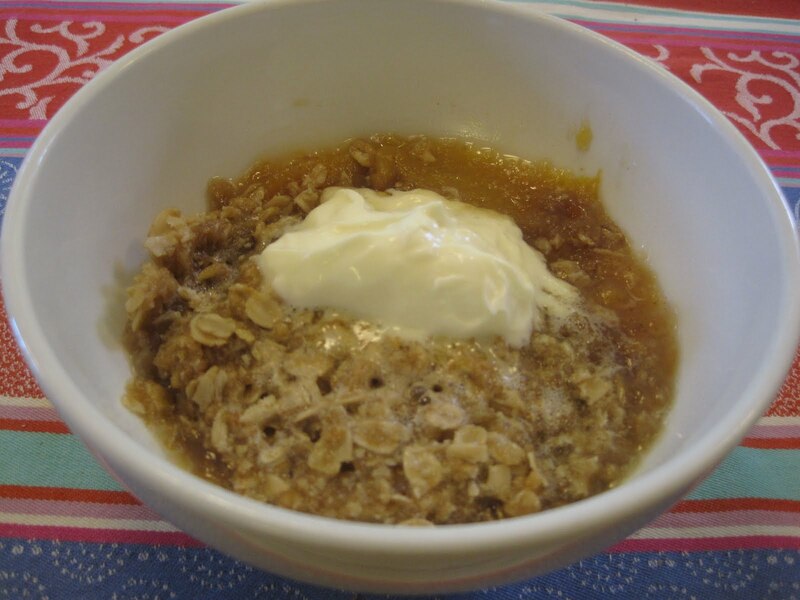 You see, my crisp recipe includes rolled oats, so I rationalize peach crisp as a healthy breakfast alternative. And if you add a dollop of creme fraiche, well then, you’re covering another one of the main food groups, right? This year, I was starting to worry. I hadn’t gotten around to putting up this filling and my farmer friends were telling me the peach season was quickly coming to an end. 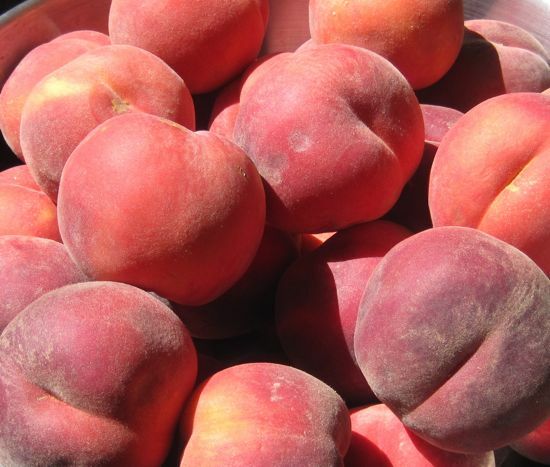 And, when the Washington State Fruit Commission offered me a box of peaches, if I would just make them into something yummy, I’ll admit, I jumped at the chance. Check out their Sweet Preservation website for some great canning resources. While I thought pie filling was certain, I spent a few days contemplating making more salsa, or some jam with lemon verbena, or some fruit leather. Even pickled peaches. 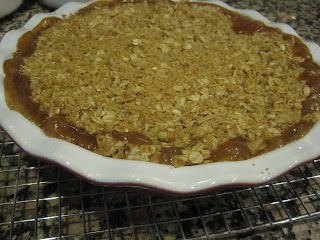 But I couldn’t imagine a winter without peach crisp. For this pie filling, I experimented with ClearJel, a modified food starch that is considered more stable than cornstarch by the USDA. It worked exactly the same as cornstarch, and now that I’ve sourced it through King Arthur, I’ll be using it for all my canned pie fillings. For the spice blend, I opened cardamom pods and crushed the little black seeds in a mortar and pestle. I like the look of the bits of black seeds floating through the filling. Substitute ground cardamom if you must. Bring a large stockpot of water to a boil. 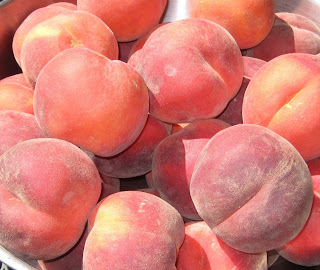 Dip the peaches in the boiling water for 30-60 seconds (the time depends on the ripeness and size of the peach – don’t cook the peaches.) Scoop out of the boiling water and transfer to a cooler or a sink filled with ice water. Make an X in the bottom of the peach and peel the skin off in four easy pieces. Remove the pit. Hopefully you have freestone peaches. Hold the slices in this bowl until you have peeled and sliced all the peaches. In a large, non-reactive pot, stir the clear gel and sugar together. Add the water and spices and bring to a boil, stirring all the time to ensure the Clear Gel doesn’t get lumpy. Add the peach slices and bring back up to a boil, cooking for five minutes. Funnel into quart sized, sanitized jars, wipe the rims, add the lids, tighten the rings and place upright in a boiling water bath for 30 minutes. Allow to sit, undisturbed, for 24 hours, then wash the jars well and store in your pantry until your next craving for summer occurs. Cut the butter into the flour, oats and sugar. 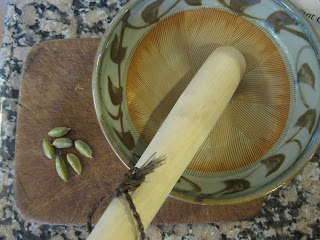 You can pulse this in the food processor, but be careful not to grind up the oats. Empty one quart of your pie filling into a deep pie dish or baking dish (9×9). Cover with the topping. Bake for 40 minutes or until the filling is bubbling. Cool slightly before serving. Oh. My. God. as the kids say; this just looks amazing and I'm always looking for recipes that use cardamon or ginger, so you get two gold stars for this one. Thanks! Oh darnit, I think our peach season is definitely over. This would make a fantastic gift for my peach-loving mother–who's the one who taught me about canning in the first place. I also had a question…ok, two: can I substitute corn starch equally for the gel? And why does it have to sit undisturbed for 24 hours? I'm in full support of peach crisp for breakfast! No need for justification at all 🙂 Thanks for sharing your recipes. I always used cornstarch, but USDA does not approve of cornstarch as a thickener, so I tried the ClearJel and it worked beautifully. As to leaving jars undisturbed, that's just what I've always heard. Leave them be, so the seals are certain! Hi, Love your site just found it this morning then I spent to rest of the day looking for instance ClearJel and couldn't find it any where. I had a couple of place offer to order it for me, but that doesn't help with what I need to get canned now. My question is if the FDA doesn't approve of corn starch and I can get a hold of any ClearJel what can I use in it's place. Also do you have any apple pie filling recipes that work well for canning. I am up to my ears in apple sauce and apple butter, but would love some pie fillings. I almost bought it from Nuts.com, too, but then I found a cheaper price on Amazon and got free shipping and 2 day delivery. You can order ClearJel from King Arthur, or look for it at a restaurant supply house. It's not expensive, but it's evidently difficult to source. You're right, cornstarch is no longer approved for pie fillings. I don't have an apple pie filling, but would use the same sort of ratios. Try it and let us know how it goes! I love this idea. I have a peck of peaches sitting in my fridge waiting for something delicious to be made from them and i think this will be it. 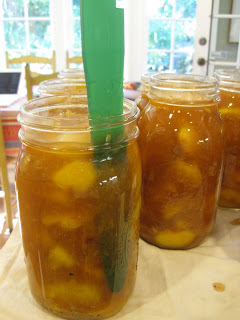 It's recommended that you stir the clear jel into the sugar, to keep it from clumping. Did you do that, or just add it to the filling? has anyone made this? There does not seem to be enough liquid? 3 TBSPs water and the 2 TBS lemon juice made a thick paste. No way it would boil. Help! Thanks so much. I have been anxious to make this and just got the clear jel – good thing I got extra. I managed to get the last of the peaches at the local orchard and did not want to lose them. Hi, Cathy. I’ve been trying to source the ClearJel, too. During the course of my research online (looking for a vendor closer than VT), I learned that there are actually two kinds of ClearJel. Several sites that mention ClearJel say that the instant is only for cold applications. 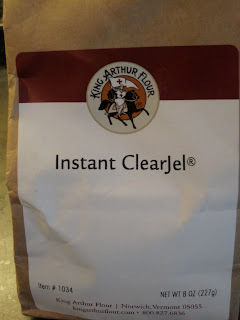 I had an online chat with the King Arthur staff, and they confirmed that the instant should not be used when canning pie fillings. Just thought you might find that interesting. ;o) P.S. Am really looking forward to trying this recipe! I just made this recipe, but I wanted to make 5 quarts instead of the 1 quart recipe here. It came out yummy, but I won’t do more than 1 or 2 quarts at a time in the future. 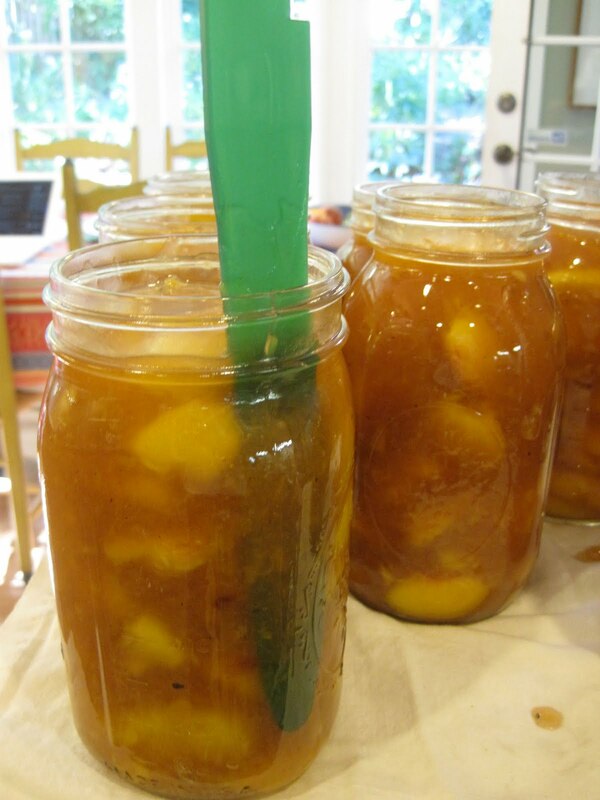 It was REALLY hard work to stir the peaches and clear jel mixture while it was boiling. Also, you can’t stop stirring or the clear jel will clump (yes, I did mix it with sugar first). 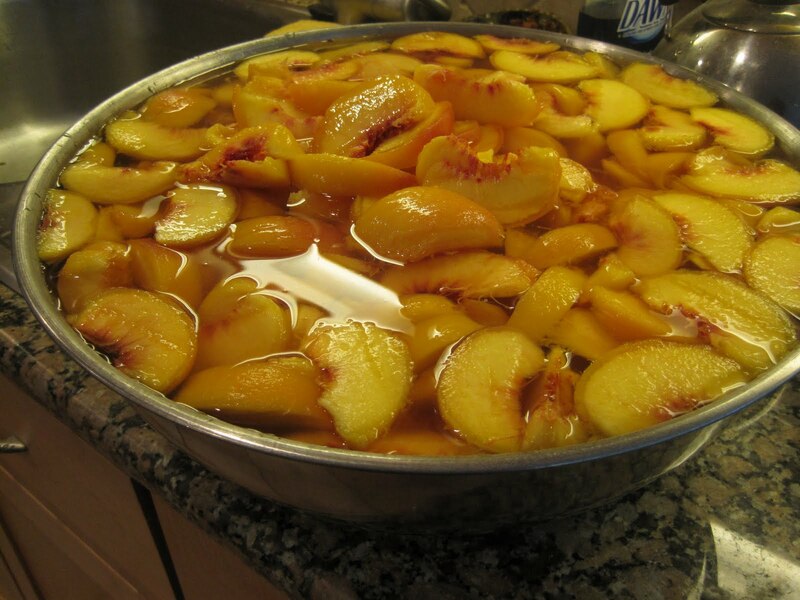 With that many peaches in the pot and all that stirring, they became broken into smaller pieces. It’s still great and still looks nice, but not as nice the picture here. I made 8 quarts today. I was dreaming of hand pies. I didn’t have allspice so I subbed some garam marsala that I love and they turned out great. Thanks for posting. My winter will have visions of summer. It was also my first time using cardamom pods. First time using my small marble mortar and pestle I found for a steal ($8) and it was heavenly to smell the queen of spices ground up. Can’t wait to enjoy the pie and give as a gift. What a happy posting! Thank you for letting me know. Happy pie!